My love for light and colour began at an early age through a talent for art and by the age of fourteen, I had my first camera, an Olympus Trip 35. Encouraged by family friend Ralph Lowey, my mother and I joined the Isle of Man Photographic Society in 1979 where we acquired a new circle of friends and I developed a passion for taking pictures. I have now clocked up twenty five years with the Society and in this time have taken many colour prints and have tried monochrome processing and printing. I have taken thousands of colour slides and together with my late father Tommy Jones, have created more than twenty seven audio visual slide presentations. As well as the social aspect of the society, my role is also that of projectionist and committee member. My cameras include two Olympus SLR's, a Minolta compact for conventional film photography and a Fuji compact for digital images. 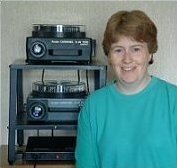 During my profession in image production with Isle of Man Newspapers my job incorporated scanning, correcting and manipulating prints, slides and digital images and also maintaining the internet for the company. Much of my work, both drawings and photographs have been reproduced in publications, calendars and cards over the years and in particular by the late Gordon Kniveton and Kate Rodgers. The images reproduced on this web site are a combination of 35mm slide as well as digital, some dating back quite a few years, others taken up to and including the summer of 2003.
holiday and I hope that others will gain as much enjoyment in viewing these images as I have in taking them. "There are no hard and fast rules"
"If you see a shot take it"
"If you are happy with it, it's a winner"
"If you don't, then it's gone forever"